Steve Bateman has stepped down from his post as manager of Southern League side Aylesbury FC after two and a half years in charge. Chasing promotion following last year’s play-off heartache, the Moles experienced a challenging season and finished eighth in Division One Central before ending their campaign by winning the Berks & Bucks Trophy two weeks ago. Aylesbury weren’t helped by a series of postponements due to the poor weather, which caused a backlog of fixtures towards the end of the season, and now Bateman has decided the time is right to step down. He said: “After a couple of weeks of personal reflection and discussions with our chairman I have decided to step down from my role of first team manager with immediate effect. “I have reached a point where I believe I have taken the club as far as I can with the resources available and it’s time for a change and a fresh approach to continue to move the club forward. Bateman enjoyed an illustrious non-league career, starting his playing days with Hemel Hempstead before joining Everton, where he went on to win the FA Youth Cup before later playing more than 300 games for Chesham. His managerial career started at Chesham but he also managed Berkhamstead Town, guiding them to a memorable FA Vase final at Villa Park, and local rivals Hemel Hempstead who he led to promotion to the Southern Premier League. Bateman was appointed Aylesbury boss in 2013, replacing Craig Faulconbridge, and spearheaded a strong promotion push last season, finishing third to Royston and Kettering before losing out in the play-offs. He added: “I have thoroughly enjoyed the challenge of the last two years and a half years and steering the club to their first ever involvement in the Southern League play-offs. 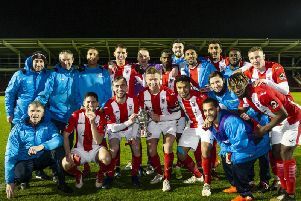 “Whilst I was bitterly disappointed not to make the play-offs this season, we achieved another milestone for the club in securing their first ever Berks and Bucks Senior Cup victory in the final against this season’s FA Cup giant killers Chesham United. “I would like to place on record my sincere thanks to everyone connected with the club for their excellent support during my time in charge with a special thanks to my management team Adam Logie, Fraser McLachlan and Liz Carson without whom none of our achievements in the last two seasons would have been possible. “My time at Aylesbury has been thoroughly enjoyable and there are some fantastic people involved who work hard and tirelessly for the club. “But it needs more involvement from the local community as the club look to progress and I urge people to step forward and get involved with Aylesbury’s premier club. The club has thanked Steve for his efforts and will make an announcement regarding a successor shortly.